I say this as someone who's never been to one, but Super Bowl media day seems pretty silly. Days before one of the biggest games of their lives, the Giants and Patriots spoke to women in bikinis, and answered questions about King Kong and stuff. Not that there's anything wrong with that. Anyway, the point is that guys from both teams were asked to weigh in on a wide range of topics, and Rich Cimini of ESPN took the opportunity to get Brandon Jacobs talking about his old teammate and close friend, Plaxico Burress. Burress, who will reportedly attend the game on Sunday, is a free agent after playing one pretty okay season with the Jets. 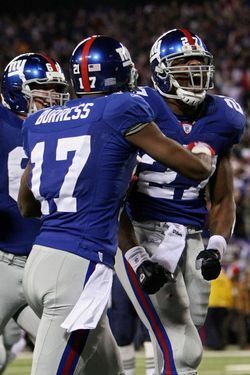 Jacobs, when asked, suggested that Burress had his heart set on returning to the Giants when he returned from prison this summer, but couldn't turn down the Jets' far superior offer. Now, though, Jacobs thinks Burress is turned off after a year of feeling underutilized on a team fraught with locker room drama. "I don't see him back with the Jets next year at all," said Jacobs, who speaks with Burress regularly. "I don't know what he's thinking, but I don't see that. They've got a lot of things going on over there, and I don't know if he wants to be part of that." "I don't see him there due to (the limited) success he had last year, and I don't think it had anything to do with him," Jacobs said. "And I'll leave it at that." A return to the Giants would seem unlikely, given Burress's public criticism of both Tom Coughlin and Eli Manning. So, if you take Jacobs at his word, it seems reasonable to expect Burress to play somewhere outside of New York for the first time since he joined the Giants in 2005. Jacobs could have the wrong impression, though, and it'd be forgivable. He's probably got some other stuff on his mind.